...Through a very ancient narrow street called D. u. Sznet Mihaly, old buildings crumbling with the years, cobbled road, and stone step walkways. It comes out at an intersection with highway 84, the large Szent Mihaly cemetery opposite, old people entering with bunches of flowers. 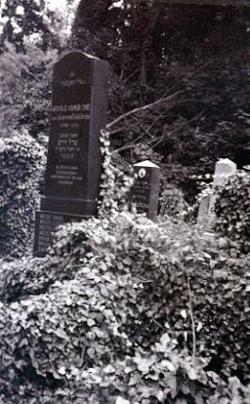 The Jewish cemetery is one block down the hill, along Tomalom utca. It sits on a corner surrounded by a fence, a gate on the diagonal of the corner, locked. An old man peers out from the white building in the grounds, and shuffles out to unlock the gate for me, accompanied by a large alsation. The caretaker and his wife occupy one end of the building, the old lady sitting in a small alcove in the sunshine peeling vegetables. The far end of the building has a high ceiling, and is only enclosed on three sides, with black and white chequered tiled floor and large arched windows facing the street. 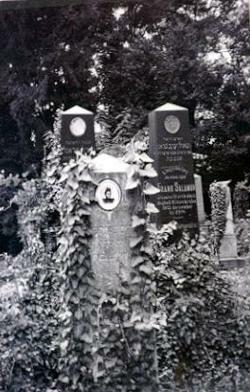 It contains a monument plaque to the 2000 or more Jews deported to their deaths from Sopron during the war. Only a small elderly community remains here. The earliest graves seem to be in the mid 1800s, but the majority are a bit later. The cemetery paths are at regular angles, a crossroads in the centre, and the place pleasantly overgrown, surrounded by a high wall and pine trees, giving it a secluded atmosphere. Some tombs have porcelain photos of the deceased, but only a couple are still intact, and not smashed or removed. There is a Holocaust memorial beside the building. In Sopron’s famous Old Town, in Uj utca [New Street] I find the two oldest synagogues in Hungary. Uj utca was called Jewish Street until the 15th century. 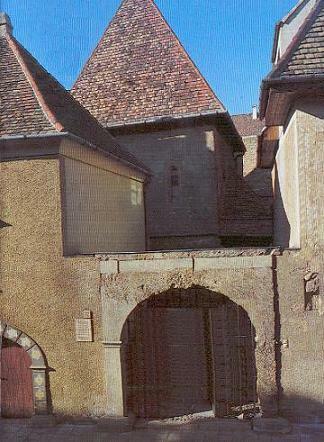 The Jews were expelled from the town in 1526, not returning until the 18th century. The restored schul at no. 22 dates to about 1300, and the other, at no. 11, dates to about 1350. They were only discovered in the course of excavations in the last forty years. The schul at no. 22 stands back from the street behind a walled gateway. Three elderly ladies man the desk at the door and take the entrance fee of 100 forints. Down steps to the left is the main prayer room, a wooden hexagonal pulpit in the centre, and an Ark edged by stone carvings at the far end. There are niches in the wall and some rare coloured glass windows throwing prisms across the room. At the back, three small windows look down from the womens’ gallery above, reached by steps from the main entrance, and much higher than the rest of the synagogue. It now houses a collection of Judaica. Some walls feature the red stone of the region. 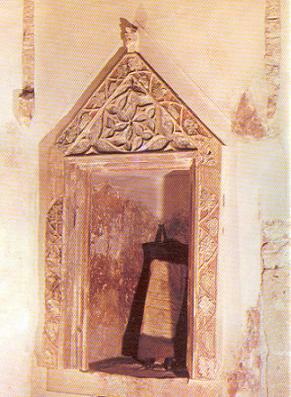 Behind the entrance desk is a door which leads to a courtyard with high walls and a rare excavated ritual bath, covered by a little shelter, and very deep.